The Indiana Cave Survey was formed about 1986 when some cavers in Indiana saw the need for a specialized organization dedicated to cataloging all cave and karst features in the state. 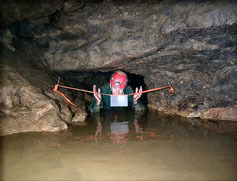 As part of this effort several tasks for the Indiana Cave Survey were identified. One was to maintain a database of all caves as well as other karst features such as springs, sinks and swallowholes, and even openings which do not currently meet the Survey’s definition of a cave, usually because the passage is found to be too short. The Indiana Cave Survey, Inc is a not-for-profit corporation registered in the state of Indiana.